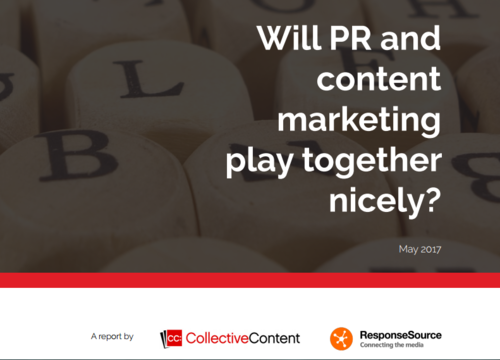 (London, 17 May, 2017) – PR professionals are split between those who see the opportunity in the rise of brand content and content marketing, as opposed to those who consider it inherently biased or helping competitors. That’s according to this year’s research carried out by Collective Content and ResponseSource. •	Those who say so-called brand journalists are treated ‘on a par with traditional journalists, was up on 2016 – 25.8% of respondents either say they are now or will be within a year. •	However, those PRs who say these content creators will never be treated equally when they engage with PRs was also up – at 33.1% of our sample as opposed to 27.4% a year ago. •	While brands are becoming more effective at determining the success of content marketing for themselves, they aren’t letting PRs in on the metrics. PRs said it is “difficult to carry out due diligence” on brand publications. •	It is common for PRs to consider brand publications biased. Just over two thirds of PRs who don’t treat brand journalists equally cited “conflict between those paying for the content and your own company/client”. •	There is a greater understanding than ever of terms such as ‘content marketing’, ‘native advertising’, ‘brand storytelling’ and indeed ‘brand journalist/journalism’. Will there be more cooperation in the future? The study shows change in attitudes is gradual. The spectrum of views from UK PRs is also broad. And, as in past years, a third of respondents even say they have never been contacted by brand journalists – which is almost impossible to believe – showing there are fundamental issues over interactions with this fast-growing area of content creation. All of this leaves the subject as one that needs more attention – for the good of PRs, brand journalists and the brands they represent. •	The tactics used with traditional journalists that aren’t (usually) employed for brand journalists. •	The greater acceptance of native advertising – often created by brand journalists – than ever before. •	What PRs said about the bias or “fixed agenda” of certain brand content. There were 382 UK respondents from the ResponseSource database to an online survey during the months of February and March 2017. Of these, 348 were in PR, with 252 (72%) at agencies and the remaining 96 (28%) in-house. The other 34 were not in PR but often in related fields such as marketing roles. The focus of the report is on the PR community in the UK.